"The president has had a number of moments of bringing the country together," she told reporters at the White House Monday, adding that the media has "a huge responsibility to play in the divisive nature of this country." 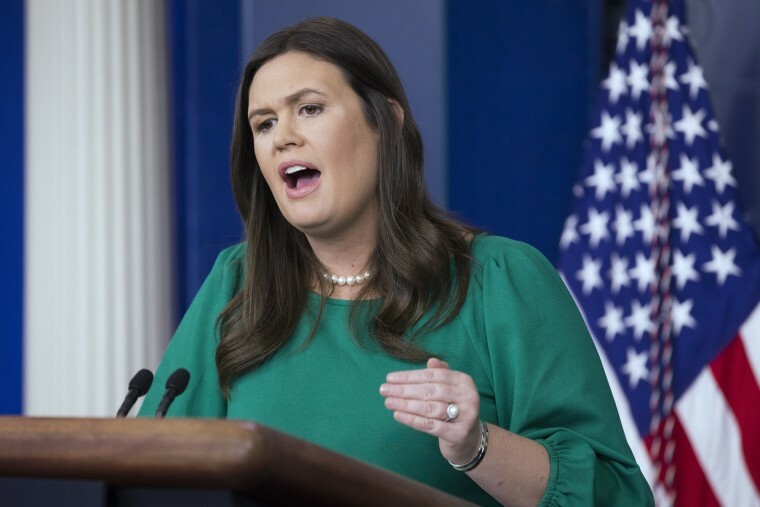 WASHINGTON — President Donald Trump is "not placing blame" on the media for divisions in the country, White House Press Secretary Sarah Sanders said Monday, just hours after Trump called the press the "true Enemy of the People" and condemned them "in part" for the "anger in our country." In a testy exchange with reporters at the White House — during her first official press briefing since Oct. 3 — Sanders criticized the media for coverage of mail bombs sent to several of Trump's political adversaries and a shooting rampage that left 11 people dead at a Pittsburgh synagogue on Saturday. Trump has taken heat for his harsh rhetoric about Democrats, including several of those who received mail bombs, in the final days before next month's midterm elections. "The very first thing that the president did was condemn the attacks both in Pittsburgh and in the pipe bombs," Sanders said. "The very first thing the media did was blame the president and make him responsible for these ridiculous acts." On Sunday night, Trump tweeted that "The Fake News is doing everything in their power to blame Republicans, Conservatives and me for the division and hatred" in the country. "Actually, it is their Fake & Dishonest reporting which is causing problems far greater than they understand!" he said. On Monday morning, he again pointed a finger at journalists. "There is great anger in our Country caused in part by inaccurate, and even fraudulent, reporting of the news," he tweeted. "The Fake News Media, the true Enemy of the People, must stop the open & obvious hostility & report the news accurately & fairly. That will do much to put out the flame...of Anger and Outrage and we will then be able to bring all sides together in Peace and Harmony. Fake News Must End!" Sanders said Trump does not consider every member of the American media a public enemy, but declined to specify which outlets or reporters he believes fall into that category. She did, however, point to CNN President Jeff Zucker's statement following the delivery of a pipe bomb to CNN in which he slammed both her and Trump for a "total and complete lack of understanding" of the impact of their attacks on the media. Asked by NBC's Hallie Jackson whether Trump was incapable of toning down his rhetoric amid acts of political violence, Sanders pushed back. "The president has had a number of moments of bringing the country together," she said. "You guys have a huge responsibility to play in the divisive nature of this country when 90 percent of the coverage of everything this president does is negative despite the fact that the country is doing extremely well, despite the fact that the president is delivering on exactly what he said he was going to do if elected, and he got elected by an overwhelming majority of 63 million Americans who came out and supported him and wanted to see his policies enacted." Trump lost the popular vote by more than 3 million ballots, but was elected president based on his 304-227 victory in the Electoral College. Sanders said Trump will travel to Pennsylvania Thursday, to "show the support of this administration for the Jewish community," despite the call by some Jewish leaders in Pittsburgh for him to stay away until he more forcefully denounces white nationalism. "He’s denounced racism, hatred and bigotry in all forms on a number of occasions — will continue to do that," Sanders said. "I'm doing it here today."